I think I'm sticking with chronological order, but I went on such a sewing bender in the first few weeks of January I can hardly be sure now. What is certain is that I stuck with the idea of using stash fabrics and stash patterns to make clothes that were definitely going to be worn. I'd made these Oliver + S Class Picnic Shorts previously as part of A's school uniform and she LOVED them. They were size 5 and were getting way too small, so it was time for some more. The idea of another navy uniform pair during the school holidays was too boring so these ones came first. I had three different coloured denims in the stash, each of which wasn't going to yield enough for a full pair of jeans. I thought it would be fun to colour block the shorts. The pattern is an absolute delight. I didn't take any photos of the insides, but the finish is really clever and the way the facing is constructed so the inner leg seam allowances are hidden at the hem line and the cute forward overlap at the sides... It's just a lovely, lovely pattern to sew. She doesn't wear woven tops often, being more of a T-shirt fan, but when I saw this cotton voile remnant in the stash and the blues and greens matched so well I couldn't help myself. The top is the same pattern, and again it's a delight to sew. The yoke is lined, front and back, and then the sleeves have a neat bias finish over the elastic at the neck line. I'm quite sure this fabric was bought in one of those moments when I'd been looking at what Lucinda had sewn for her daughter (Check out this Flickr pool for serious inspiration). Every now and then she would use a big scale print and I'd fall hard. So I'd buy a similar fabric, then stall on how to use it. On Instagram I've seen Lucinda start the year with a pledge to sew 10 pieces of stashed fabric and 10 already owned patterns before succumbing to the lure of new stuff. While I may have already breached those rules I'm definitely going along in spirit. And so, this outfit was inspired by her as well as her having been the inspiration for the original fabric purchase way back when. Another tiny dent in the fabric stash and an outfit that makes me ridiculously happy to see worn. Seriously, those shorts are incredibly cute on. Try them if you haven't already! The Class Picnic Shorts are a favourite in our house, too! I've lost count of how many times I've made them. Last time I used just bias binding in place of the facing for a change. Hi Ann, I imagine the bias binding would speed things up a bit., They're not "easy" shorts to make but the neat finish makes it worth it. Aren't they the best to see worn. I was excited to see they run to size 12, I fearedthese sized out at 8 and I was in my last year of sewing them. Phew. Love those colour blocked shorts! The top is gorgeous, too. I'm often attracted to big prints, but it takes a simple pattern to make them work - the picnic blouse is perfect. Thanks Marisa. I have a few of these cotton prints in the stash and am always unsure what to do with them. This blouse did seem perfect and it used up al the fabric and fit the print perfectly. Winning! 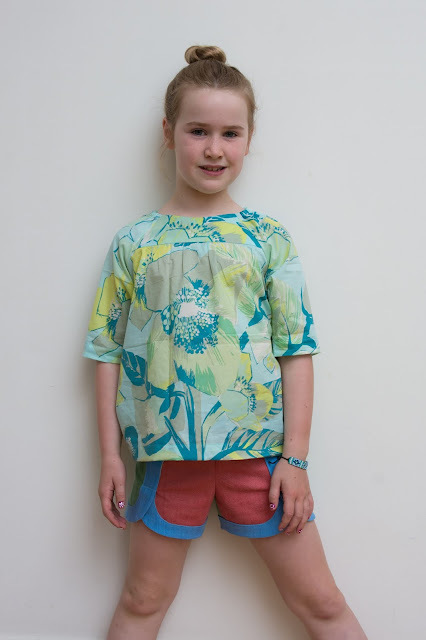 Fun colour blocked shorts and the stashed fabric for the blouse is perfect. Thanks, I'm so glad I used that fabric. I'm feeling very virtuous about all my stash sewing. Miss A carries that bold print beautifully.